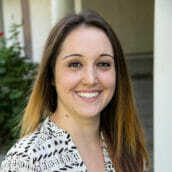 Ms. Lauren is an Orange County native who found her passion for teaching in Northern California. During her time at UC Santa Cruz, she assistant-taught university literature classes, tutored struggling college freshmen, and taught writing to high school foreign exchange students. She was a featured memoirist at the UCSC Undergraduate Literature Colloquium in 2012, and a featured poet at the 2011, 2012, and 2013 UCSC Living Writers Series. After a year-long mentorship with the late Donald Rothman, founder of The Central California Writing Project, Lauren was inspired to teach critical thinking and analytical writing to students in the county where she grew up. Since graduating with an honors degree in Literature and Poetry in 2013, Lauren has been teaching writing and literature to Orange County homeschool and public school students from grades two through twelve, as well as to college students and working professionals. Whether in private lessons or in her creative writing and literature classes, she deeply connects with all students, with her genuine passion for student success revealing itself in vibrant and consistent positive reinforcement. Lauren believes in creating a learning environment with endless laughter, respect, and encouragement, as these are the very elements that allow students to take positive risks in writing towards comprehensive academic growth. When not teaching, Lauren finds enrichment in camping, cooking, reading all genres, working on cars, and writing poetry. Her heart belongs to her two small dogs, and she even wishes she could teach them to write so they could communicate! She is a daily meditator and a vegetarian who believes that diving into deep discussion with individuals of all ages and backgrounds can lead to a more fulfilling existence.